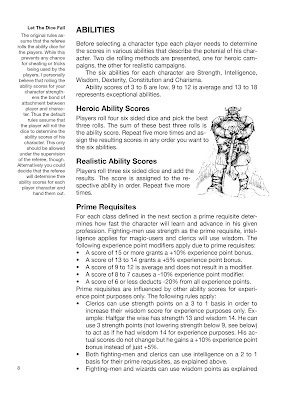 Since I have been writing on the actual rules for some time now I just wanted to give you a quick expression of the layout of a single page: Here's the intro to the abilities in the game. The main text is broken up with more images. I'm a big fan of game art (and be it for pure inspirational value - I know I spent hours and hours just looking at the pictures of the red box D&D edition and dreaming of what might be or might have been). 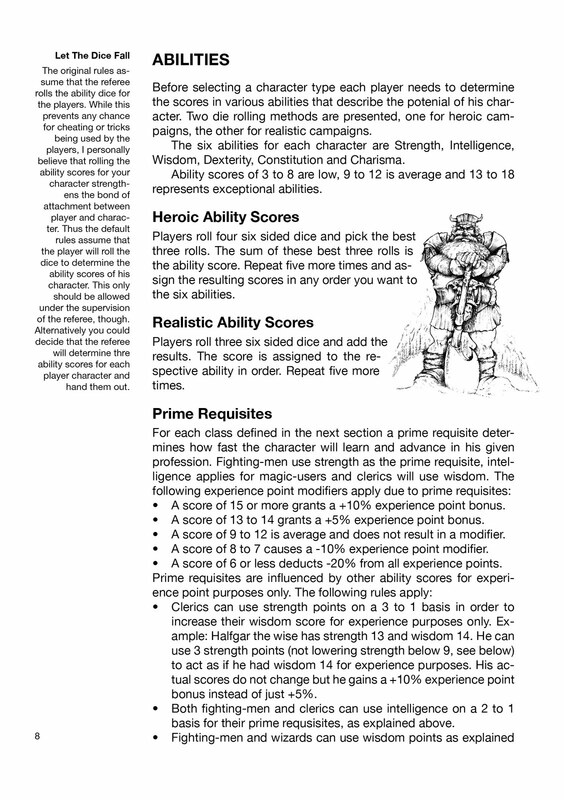 Thus 'The Fantasy Game' will have a minimum of one piece of art per double page, hopefully most of the time relevant. By now I have purchased a collection of several thousand stock art pieces, so there should be ample choice. The main text is accompanied by sidebars facing the outside of the pages. These sidebars contain explanations, intricate details for OSR researchers and other things that do not really belong into the main text. It will be perfectly possible to just read the main body - only if you care for designer thoughts, historical remarks, the occasional rules option and other exotic stuff the sidebars should be of interest to you. It looks pretty damn good to me! Everything is super clear and readable and you suggest more than one option to roll up a character. I'm really intriguing to see how this approach works in the combat chapter. I think it would be better to use a serif font for the running text. Headings in Helvetica is fine but Times Roman or something similar will be much easier to read. If you look at the original ODD books you will see that the first 3 were in a sans font (earlier Futura, then later Univers, except for some changes like the removed Tolkien replacement text which was Helvetica) while the supplements are typeset in a serif font. They are much more readable (although this is partly because TSR seems to have gained some sophistication - they use bold and italic text instead of underlines) as a result.